On this page you can find an overview of our dynamometer for the measurement of tension and compressive force. We offer dynamometers for a very wide range,whichcovers almost every application area. Generally, dynamometers do serve for the measurement of forces, which can happen quite different. Therefore, our dynamometers can be transformed from to traction gauges to compressive force gauges. Our traction gauges, which are available in the units Gramm or Newton, have a taring range of 20 % from the whole measuring range and an accuracy of ± 0,3 % of the total load. Dynamometers with a measuring range from 5 to 1000 g have a clamp to bear the load, while dynamometers with a measuring range from 2,5 to 50 kg do possess a hook for the measurement. Our largest dynamometer has a karabiner as load suspension device. Furthermore, pressure sets are available in our product range. With their help it is possible to transform a tension gauge into a compressive force gauge. In addition to the mechanic dynamometers, there are also digital models in our product range. These dynamometers do often possess a slot for memory cards in order to store the evaluated data. Moreover, they do often provide an interface for data transfer and optional software. That guarantees an easy documentation and analysis of the measured values. PCE-CS 300 is a digital, battery-powered Dynamometer for indoor use. The rugged design of the Dynamometer accommodates applications in rough industrial conditions as well as in fields such as food and hygiene. PCE-CS 1000N is a digital, electronic, battery-powered Dynamometer that displays measurement values in kilograms (kg) or pounds (lbs). The scale comes factory calibrated and includes a hook, shackle and remote control. For an additional fee, the scale can be calibrated according to ISO standards. PCE-CS 1000N-ICA is a digital, electronic, battery-powered dynamometer that displays measurement values in kilograms (kg), pounds (lbs) and freely adjustable units. 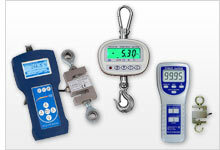 The scale includes a hook / shackle, remote control and ISO calibration certificate. PCE-CS 3000N is a digital rechargeable battery-powered heavy-duty Dynamometer that displays measurement values in kilograms (kg) or pounds (lbs). The Dynamometer comes factory calibrated and includes a hook, shackle and remote control. For an additional fee, the scale can be calibrated according to ISO standards. PCE-CS 3000N-ICA is a digital, rechargeable battery-powered, heavy-duty dynamometer that displays measurement values in kilograms (kg) or pounds (lbs). The dynamometer includes a hook, shackle, remote control and ISO calibration certificate. PCE-CS 5000N is a digital battery-powered Dynamometer that displays measurement values in kilograms (kg) or pounds (lbs). The Dynamometer comes factory calibrated and includes a hook, shackle and remote control. For an additional fee, the scale can be calibrated according to ISO standards. PCE-CS 5000N-ICA is a digital battery-powered Dynamometer that displays measurement values in kilograms (kg) or pounds (lbs). The Dynamometer includes a hook, shackle, remote control and ISO calibration certificate. PCE-CS 10000N is a digital battery-powered heavy-duty industrial crane, lifter, suspended or hanging scale, dynamometer, electronic balance or weighing hook that displays measurement values in kilograms (kg) or pounds (lbs). The scale comes factory calibrated and includes a hook, shackle and remote control. For an additional fee, the scale can be calibrated according to ISO standards. PCE-CS 10000N-ICA is a digital battery-powered heavy-duty industrial crane, lifter, suspended or hanging scale, dynamometer, electronic balance or weighing hook that displays measurement values in kilograms (kg) or pounds (lbs). The dynamometer includes a hook, shackle, remote control and ISO calibration certificate. The dynamometer PCE-FM 200 is a handheld device that measures up to 200 N. The dynamometer PCE-FM 200 can determine the units N, kg and lb. The PCE-FM 200 dynamometer is supplied with various adapters that have different shapes. The dynamometer PCE-FM 200 can measure both tensile and compressive forces. The PCE-FM 500N dynamometer is a microprocessor controlled dynamometer with fast and accurate readout of tensile and compressive forces in N, Kg and lb. The display of the force gauge is easily readable by the large numbers. The force gauge is equipped with an internal load cell for tensile and compression tests. This dynamometer is a tensile / compressive force gauge. This traction / compression force gauge has an internal load cell. It is a portable traction / compression force gauge that can be installed in a force measurement stand. The PCE-PTR 200N dynamometer is a hand-held device up to 200 N. The PCE-PTR 200N dynamometer can determine the units N, kg and lb. The PCE-PTR 200N dynamometer comes with various shaped adapters. With the PCE-PTR 200N dynamometer both tensile and compressive forces can be measured. The dynamometer PCE-FM 200 is a handheld device that measures up to 200 N. The dynamometer PCE-FM 200 can determine the units N, kg and lb. The PCE-FM 200 dynamometer is supplied with various adapters that have different shapes. The dynamometer PCE-FM 200 can measure both tensile and compressive forces. This dynamometer comes with an ISO calibration certificate (PCE-FM 200-ICA). Digital Dynamometer PCE-DFG N 10 for tensile force measurement and force measurement up to 10 N. The PCE-DFG N 10 is a digital dynamometer for precise measurements with a resolution of 0.005 N. The Dynamometer PCE-DFG N 10 can be purchased here in our shop. Digital dynamometer PCE-DFG N 20 for tensile force measurement and force measurement up to 20 N. The PCE-DFG N 20 is a digital dynamometer for precise measurements with a resolution of 0.01 N. The dynamometer PCE-DFG N 20 can be found here in our shop to buy. Digital dynamometer PCE-DFG N 200 for tensile force measurement and pressure force measurement up to 200 N. The PCE-DFG N 200 is a digital dynamometer for precise measurements with a resolution of 0.1 N. The dynamometer PCE-DFG N 200 can be found here in our shop to buy. Digital Dynamometer PCE-DFG N 5 for tensile force measurement and force measurement up to 5 N. The PCE-DFG N 5 is a digital dynamometer for precise measurements with a resolution of 0.001 N. The Dynamometer PCE-DFG N 5 can be purchased here in our shop. Dynamometer PCE-DFG N 500 for tensile force measurement and pressure force measurement up to 500 N. The PCE-DFG N 500 is a digital force gauge PCE-DFG N 500 for precise measurements with a resolution of 0.1 N.